Announcement Welcome to the Etsy page for the Dead End Doll Factory...birthplace of my most morbid creations! I will be adding more dolls as they become available. Please message me with any questions! Each doll is plucked from their place of death and transformed into a creepy oddity for folks of all ages. All of the dolls listed have a cloth body with porcelain face, neck, hands legs and feet. Each are refurbished, hand painted with acrylics and varnished for eternal undead existence. Clothes are hand dyed and hair is washed....we can't be having any stinky "crawling dead". 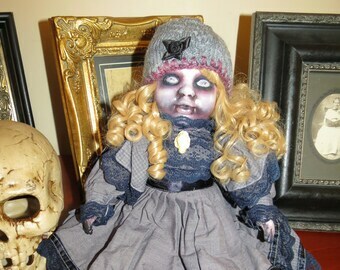 Welcome to the Etsy page for the Dead End Doll Factory...birthplace of my most morbid creations! I will be adding more dolls as they become available. Please message me with any questions! Very satisfied. Doll looks amazing. Tremendous. Seller is incredibly talented and a pleasure to deal with. Thank you Dead end Doll Factory!! Splendid work of art! Spirit doll. Greetings, my creeps! 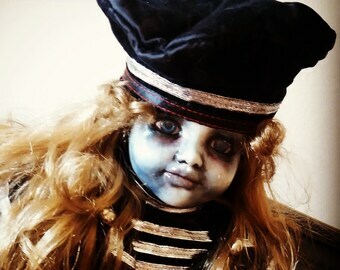 Halloween is almost here and the Dead End Doll Factory is having a SPOOKY sale! Use coupon code HORROR for 50% off purchase of $50 or more! Whoa! 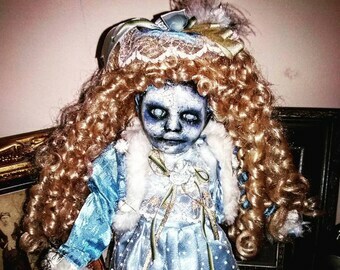 The Dead End Doll Factory is the birthplace of my most morbid creations, made to haunt your dreams and scare Grandma. Each doll is plucked from their place of death and transformed into a creepy oddity. All clothes are hand dyed, their hair is washed and combed, the face, hands and legs are hand painted with acrylics and varnished for eternal undead existence. All dolls have a cloth body with porcelain faces, hands and feet. My creations are very fragile and not to be played with, as the porcelain will break if dropped or hit hard enough....it's porcelain. I do take requests for custom dolls. Please message me at amber.whitaker [!at] yahoo.com with any questions. Thank you for your interest in the Dead End Doll Factory! Dolls not brand new. 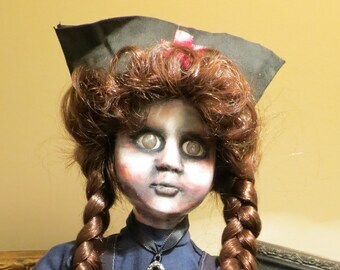 They are used dolls that I find at Flea markets and the like that are refurbished and given new life. They are not perfect....much like a lot of art. I will do my best to point out all imperfections in my listings, but please be aware that these dolls are not brand new out of the box and have some usual wear. Please contact me within 24 hours about payment. PAYPAL Payment is expected within 2 days, unless prior arrangements are made. For domestic shipping: I will ship your item within 3 business days after receiving payment. For International Shipping: I will ship your item within 5 business days after receiving payment due to customs form requirements. 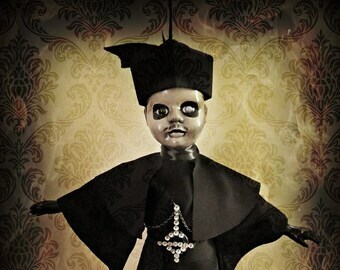 For custom orders, such as the Papa Emeritus doll, please allow two weeks, as this is a made to order doll.